An Ordinary Meeting of the Bega Valley Shire Council will be held at Council Chambers, Bega on Wednesday, 17 May 2017 commencing at 2.00 pm to consider and resolve on the matters set out in the attached Agenda. Council meetings are recorded and live streamed to the Internet for public viewing. By entering the Chambers during an open session of Council, you consent to your attendance and participation being recorded. The recording will be archived and made available on Council’s website www.begavalley.nsw.gov.au. All care is taken to maintain your privacy; however as a visitor of the public gallery, your presence may be recorded. For more detailed definitions refer to Sections 442, 448 and 459 or the Local Government Act 1993 and Model Code of Conduct, Part 4 – conflictions of interest. Whilst seeking advice is generally useful, the ultimate decision rests with the person concerned.Officers of the following agencies are available during office hours to discuss the obligations placed on Councillors, officers and community committee members by various pieces of legislation, regulation and codes. Under the provisions of Section 451(1) of the Local Government Act 1993 (pecuniary interests) and Part 4 of the Model Code of Conduct prescribed by the Local Government (Discipline) Regulation (conflict of interests) it is necessary for you to disclose the nature of the interest when making a disclosure of a pecuniary interest or a non-pecuniary conflict of interest at a meeting. In my opinion, my interest is pecuniary and I am therefore required to take the action specified in section 451(2) of the Local Government Act 1993 and or any other action required by the Chief Executive Officer. – In my opinion, my interest is non-pecuniary but significant. I am unable to remove the source of conflict. 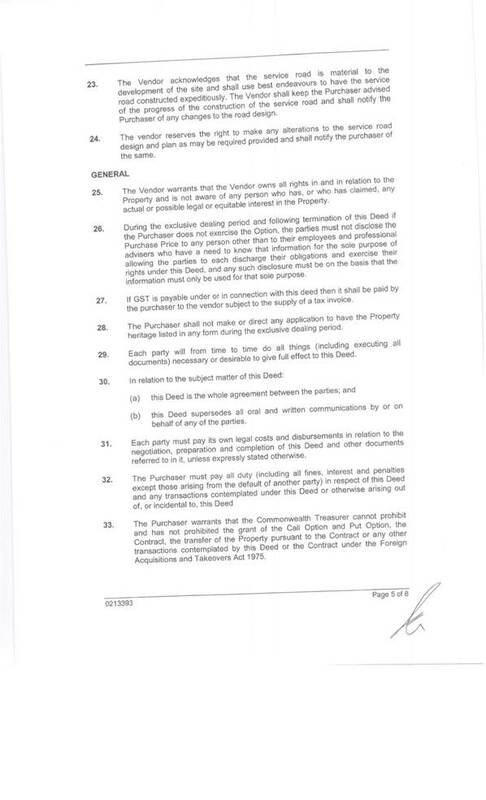 I am therefore required to treat the interest as if it were pecuniary and take the action specified in section 451(2) of the Local Government Act 1993. In my opinion, my interest is non-pecuniary and less than significant. I therefore make this declaration as I am required to do pursuant to clause 4.17 of Council’s Code of Conduct. However, I intend to continue to be involved with the matter. · The reason(s) why you consider the situation may (or may be perceived to) give rise to a conflict between your personal interests and your public duty as a Councillor. I disclose the above interest and acknowledge that I will take appropriate action as I have indicated above. NB: Please complete a separate form for each Item on the Council Agenda on which you are declaring an interest. 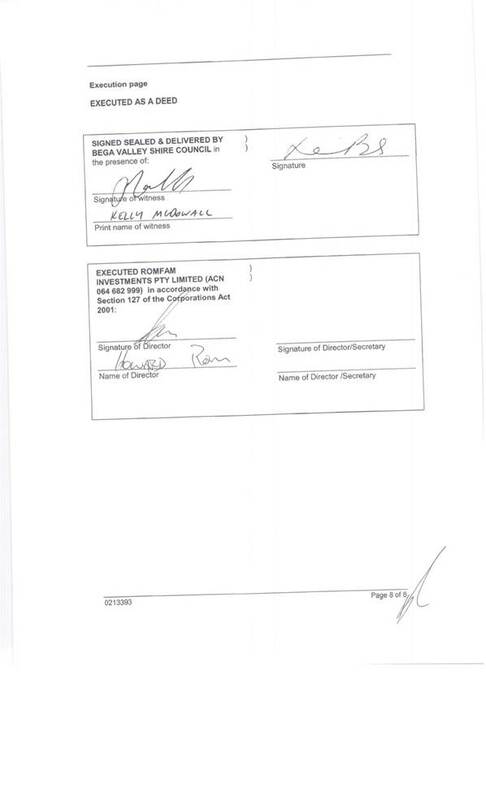 Pecuniary, Non-Pecuniary and Political Donation Disclosures to be declared and tabled. Declarations also to be prior to discussion on each item. In accordance with Council’s Code of Meeting Practice, this section of the agenda will be chaired by Cr Seckold. In accordance with Council’s Code of Meeting Practice , this section of the agenda will be chaired by Cr Griff. In accordance with Council’s Code of Meeting Practice, this section of the agenda will be chaired by Cr Nadin. In accordance with Council’s Code of Meeting Practice, this section of the agenda will be chaired by Cr Tapscott. In accordance with Council’s Code of Meeting Practice, this section of the agenda will be chaired by Cr Bain. 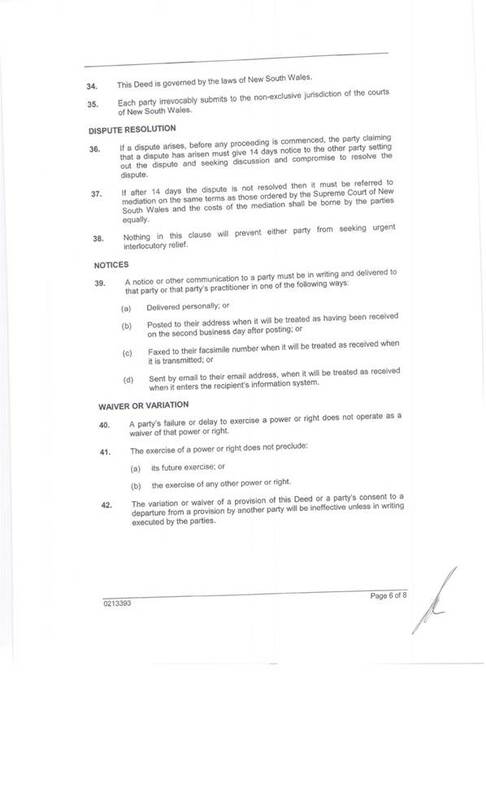 This report is confidential in accordance with section 10A (2) (i) of the Local Government act 1993 as the report contains alleged contraventions of any code of conduct requirements applicable under section 440. 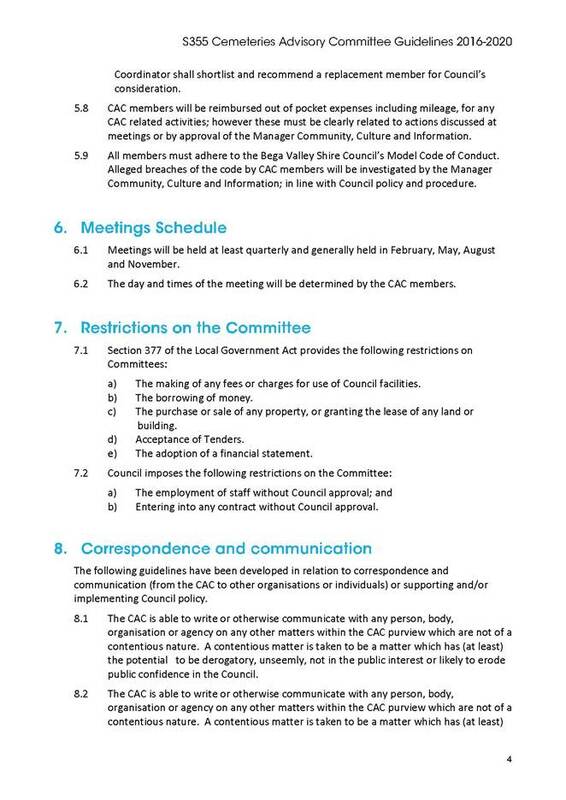 In accordance with Council’s Code of Meeting Practice (2011), this section of the agenda will be chaired by Cr Griff. Nominations have been received for the Section 355 Cemetery Advisory Committee and are presented for Council’s consideration. 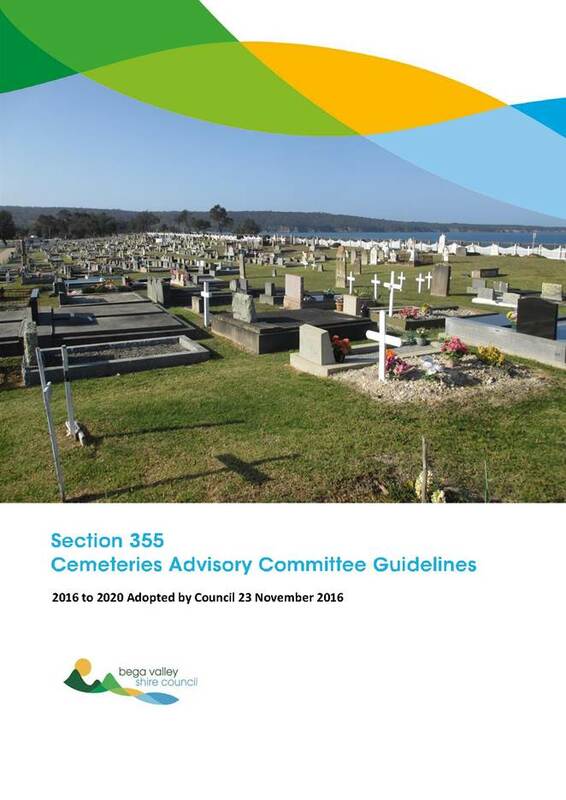 Council adopted revised Guidelines for the Cemetery Advisory Committee (CAC) at its Ordinary Meeting on 23rd November 2016. Following adoption of the Guidelines, CAC Committee positons were advertised. An assessment panel was convened to review the applications and have made recommendations for Council’s consideration. 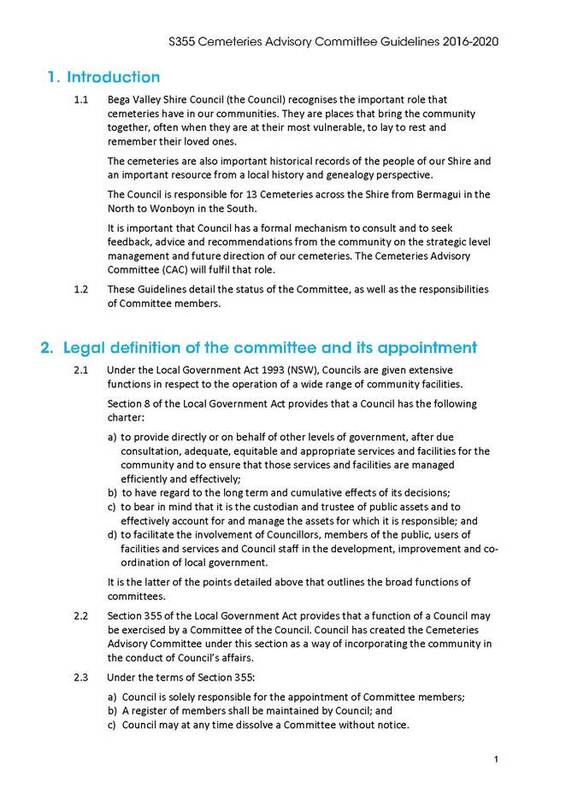 Council is able to appoint a Committee of Council under Section 355 of the Local Government Act 1993. The strategic consideration of cemetery issues for Council is critical in meeting the needs of all residents. Stakeholder and community input is an essential factor in management and care of existing Council assets and infrastructure, and the CAC plays an important role in providing input into this process. A2 Facilities and services: Our infrastructure, facilities and services are strategically planned, located, designed and maintained to meet our local and visiting community needs. Cemeteries play a significant role in our communities. They are places that bring the community together, often when they are at their most vulnerable, through laying to rest and remembering their family members and friends. The cemeteries are also important historical records of the people of our Shire and an important resource from a local history and natural resource perspective. Cemeteries also act as potential tourism sites. There is a growing movement in developing cemetery tours in areas around Australia. 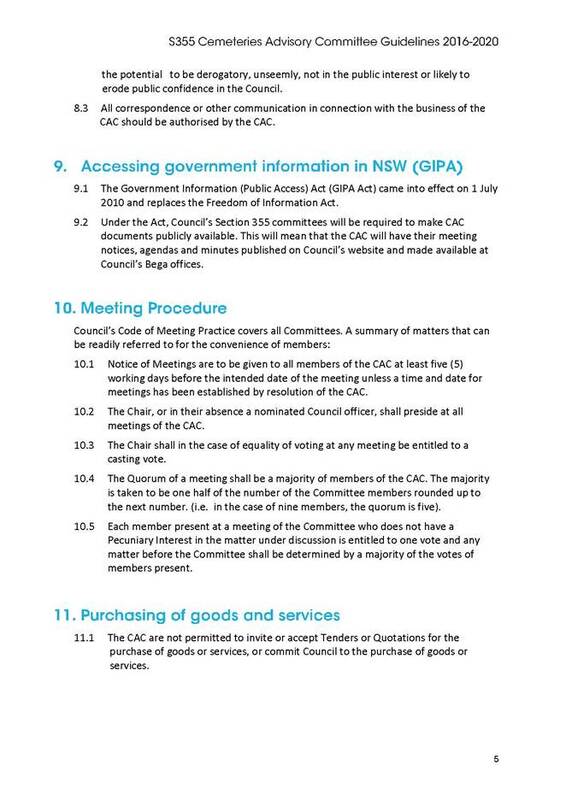 The Guidelines for the CAC were recently updated and adopted by Council in November 2016. During the revision of those Guidelines the previous 355 Cemetery Committee were consulted and changes made. The opportunity to join the CAC was advertised in the local media, promoted through Council’s social media sites and available on Council’s website. It was also sent to cemetery volunteers and all previous members of the most recent 355 Cemetery Committees. A total of nine applications were received, five of whom are currently active volunteers in the Shire’s cemeteries, and four of whom would bring new skills and expertise to the CAC. An assessment panel consisting of Cr Jo Dodds and staff members from the Community, Culture and Information area met and assessed applications for suitability. 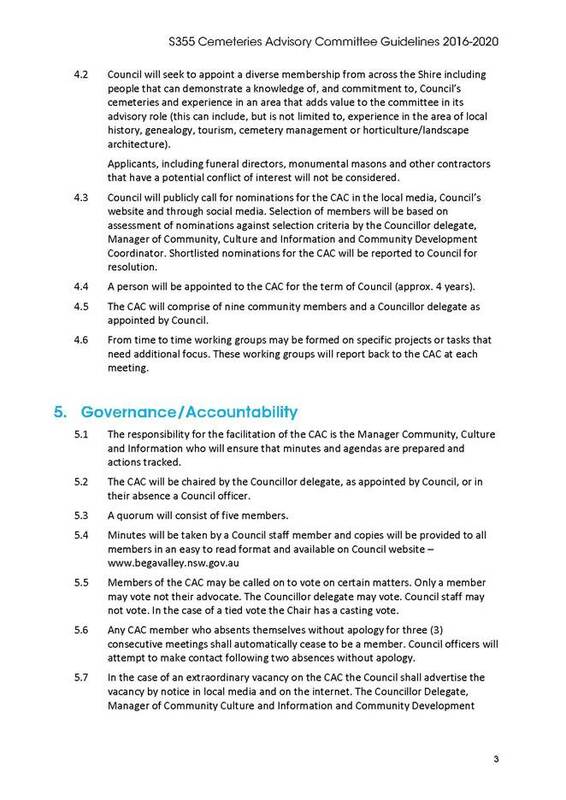 The CAC is an advisory committee and has no role in administering funds. Costs associated with the administration and support of the committee is covered in Council’s Cemetery program budget. The risk to Council relates to the potential investment and development of infrastructure and services which must consider a broad range of stakeholder needs and could otherwise alienate members of the community. 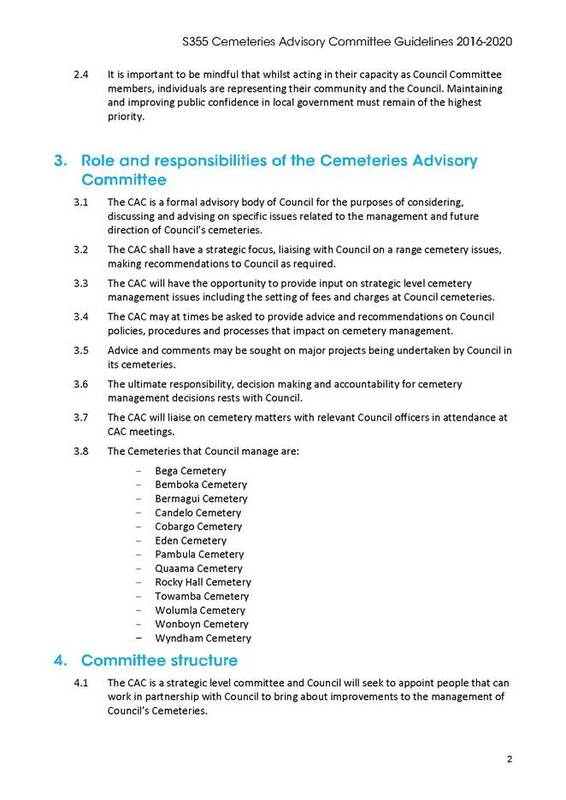 The CAC provides an expert advisory committee to assist Council achieve the best possible outcomes for the management and care of Council’s 14 cemeteries. Nominations have been received from people with a diverse range of skills and relevant experience, including experienced cemetery volunteers. The CAC demonstrates a great way to engage and connect with a range of community members on the Shire’s cemeteries. 1. That Council adopts the recommendation of the Assessment Panel. 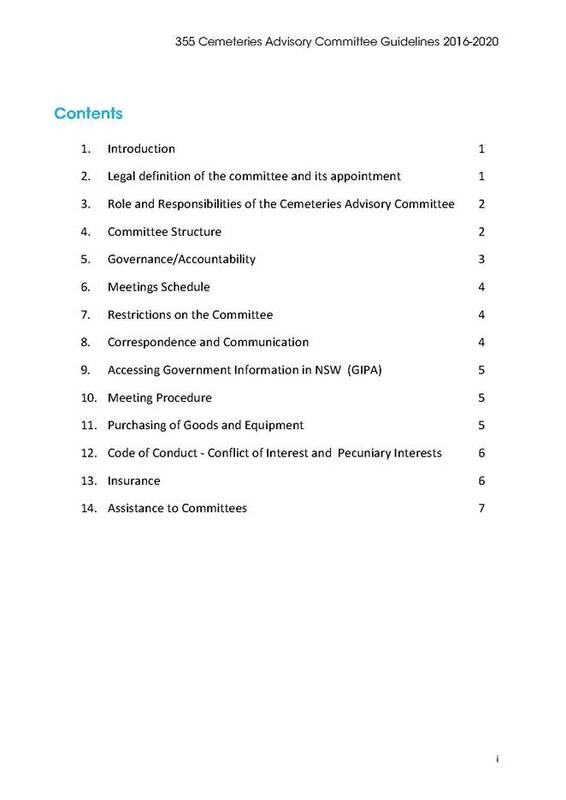 In accordance with Council’s Code of Meeting Practice (2011), this section of the agenda will be chaired by Cr Nadin. 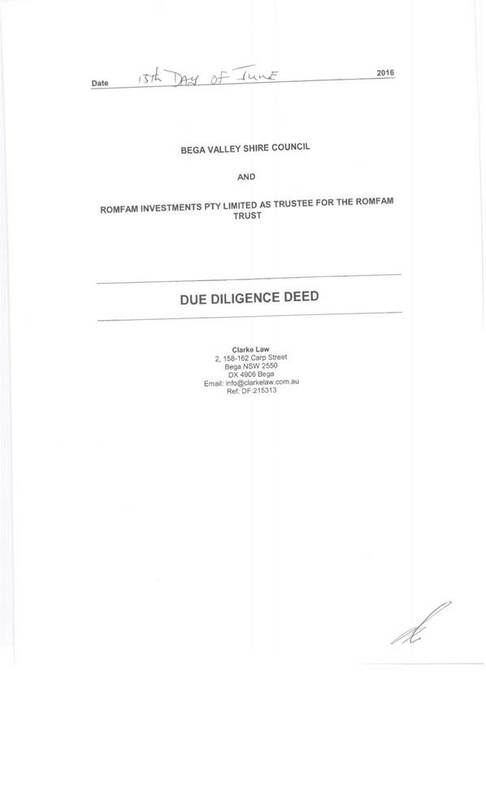 A request has been received from Romfam Investments Pty Limited as Trustee for the Romfam Trust to extend a Due Diligence Deed related to Lot 946 DP604076 and Lot 949 DP810986, Main Street Merimbula. 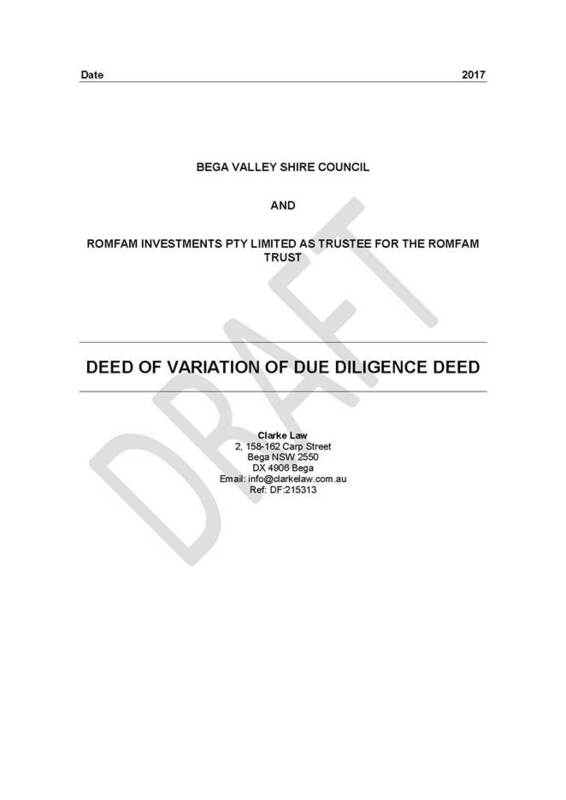 On the 15 June 2016, Bega Valley Shire Council and Romfam Investments Pty Limited as Trustee for the Romfam Trust (the purchaser), executed a Due Diligence Deed. The details relate to Council’s ownership of 103 and 105-107 Main Street, Merimbula (Lot 946 DP604076 and Lot 949 DP810986). The purchaser, having expressed an interest in the commercial development of the Lots including a supermarket, requested time to carry out due diligence before proceeding. Council agreed to grant the purchaser a twelve (12) month exclusive dealing period. This period expires on 15 June 2017. 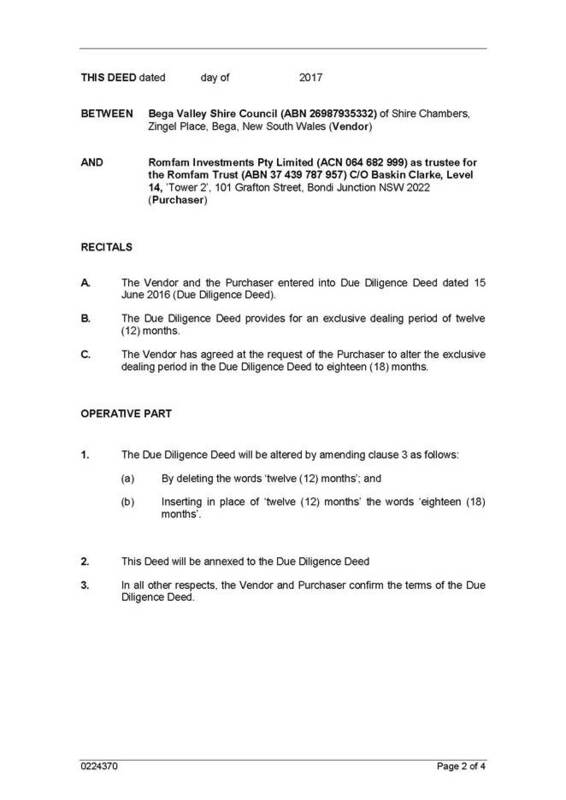 The purchaser has requested a six (6) month extension of the Due Diligence Deed. A draft Deed of Variation of Due Diligence has been prepared by Council’s legal representatives and is attached for the information of Councillors. The Deed of Variation will be the instrument that formalises an extension of the existing Due Diligence Deed with the purchaser. The sale of the subject land and the intended use of the purchaser both accord with Bega Valley Shire Council’s Economic Development Strategy. 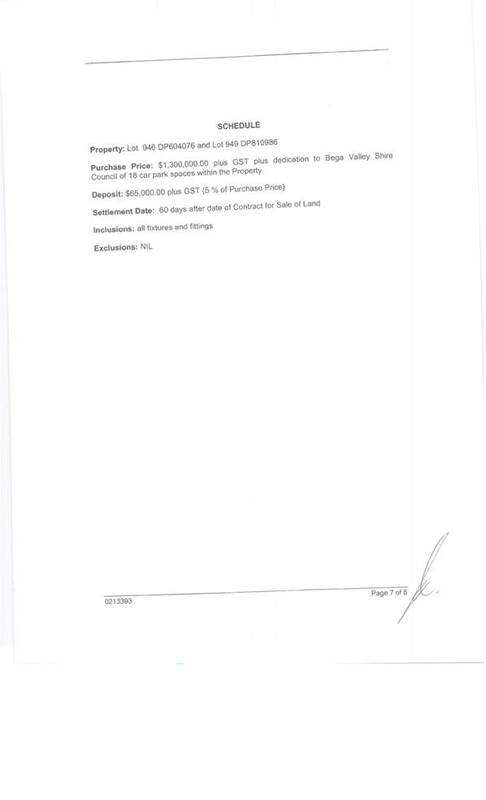 The agreed purchase price of the subject land under the terms of the Due Diligence Deed is $1.3M (plus GST). 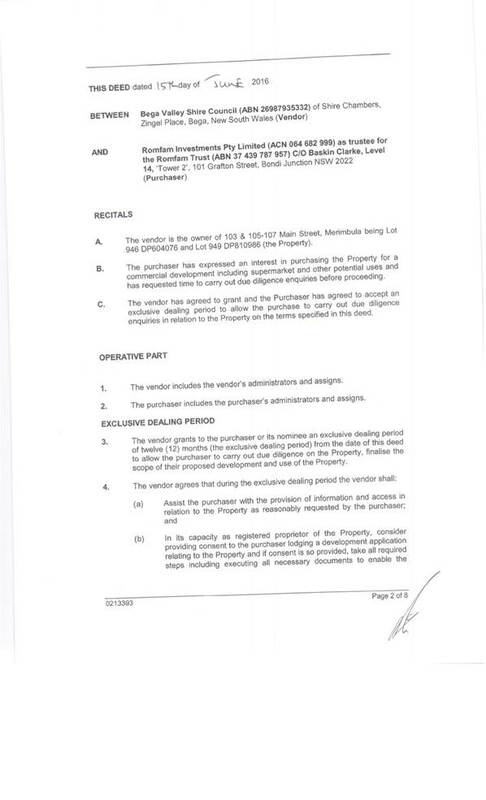 A deposit of 5% of the purchase price is to be paid upon signing of the Contract for Sale, being $65,000 (plus GST). The risk to Council in extending the Due Diligence Deed would be that the property remains off the open market for a further period of six (6) months and Romfam Investments do not proceed with a purchase of the site. 3. Relist the property on the open market. Strategy and Business Services and Planning officers have met with the purchaser. Romfam Investments and the retailer which they represent, have prepared and discussed detailed plans for the site. The purchaser has requested in writing a six (6) month extension to the Due Diligence Deed, citing the reason for this request will provide them with the opportunity to move towards obtaining Development Consent. 2. That Council authorise the General Manager to execute the Deed of Variation of the Due Diligence Deed. This report details the outcome of evaluation of the Tender RFT37/17 for the replacement of guardrail on various sections of Myrtle Mountain Road and recommends award to the preferred tender. In the 2015/2016 and 2016/2017 financial years, Assets Section officers performed condition assessments on guardrail infrastructure located within Council’s road network. It has identified that some sections require upgrading to maintain optimum performance. Council has now sought tenders to replace the guardrail along Myrtle Mountain Road with guardrail that meets Australian and Roads and Maritime Services (RMS) standards. The Tender was written in accordance with NATSPEC and Roads and Maritime Services (RMS) specifications for the supply and installation of guardrail. These specifications are in accordance with Australian and RMS standards. Myrtle Mountain Road is classified as a Collector Road under Council’s adopted hierarchy, in accordance with the Transport Asset Management Plan. All works are located within Council’s road reserve, on Council owned land. A site specific Environmental Management Plan (EMP) will be provided to Council by the successful contractor. Asset condition inspections identified that guardrail located along Myrtle Mountain Road is in sub-optimal condition and in need of replacement. This contract for guardrail replacement is the first in addressing the condition of guardrail located with Council’s road network. The project will ensure guardrail systems continue to meet Australian and RMS standards. The preferred Tenderer has submitted a very competitive price and has delivered previous projects for Council in a satisfactory and effective manner. It is recommended the preferred tender be accepted as they have been assessed as providing the best overall value to Council. 2. 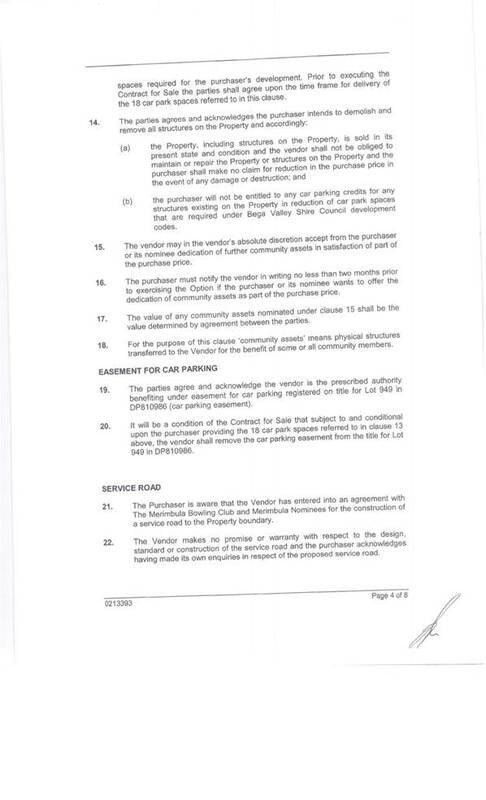 That Council accept the tender from <insert> in relation to contract for the works described in Tender 37/17 for guardrail replacement on Myrtle Mountain Road, in the amount of <insert> (including GST), subject to variations, provisional sums and prime cost items. 3. That authority is delegated to the General Manager, or Director Transport and Utilities in the absence of the General Manager, to execute all necessary documentation. This report details the outcome of the evaluation of Tender RFT39/17 for the replacement of two timber bridges with reinforced box culverts (RBC) located at chainage 8.89 and 19.16 along The Snake Track and recommends award to the preferred tender. The Tender was written in accordance with NATSPEC and Roads and Maritime Services (RMS) specifications for the supply and installation of bridges. These specifications are in accordance with Australian and RMS standards. All works are located within The Snake Track road reserve, on Council owned land. Consultation between Council’s Works and Assets Sections identified, planned, designed and will deliver the project. This contract for replacement of the two timber bridges is aimed at reducing maintenance costs by limiting travel time, site establishment and demobilisation to remote areas. This project will provide the best value for money solution to the ratepayer by demonstrating effective maintenance planning throughout the road and bridge network. The project will deliver a product that meets Australian and RMS standards. The preferred Tenderer has submitted a very competitive price and has delivered previous projects for Council in a satisfactory and effective manner. Council recommends the preferred tenderer be accepted as they have been assessed as providing the best overall value to Council. 2. 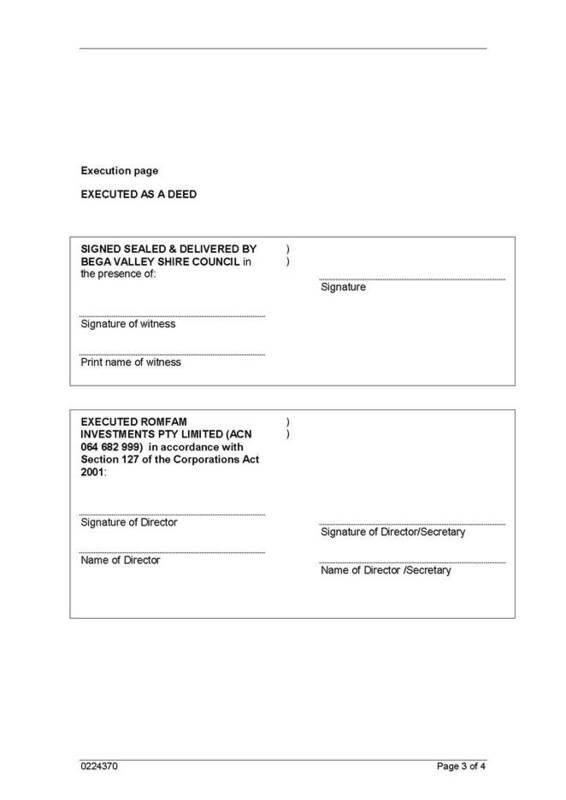 That Council accept the tender from <insert> in relation to contract for the works described in Tender 39/17 for the replacement of two timber bridges with reinforced box culverts on The Snake Track, in the amount of <insert> (including GST), subject to variations, provisional sums and prime cost items. 3. That authority is delegated to the General Manager or the Director of Transport and Utilities in the absence of the General Manager, to execute all necessary documentation. This report details the outcome of the evaluation of Tender 29/17 for the Merimbula Central Business District (CBD) Bypass, Market Street and Monaro Street Intersection reconstruction, and recommends award to the preferred tenderer. The Merimbula CBD Bypass Project aims to reduce traffic congestion within the Merimbula CBD and improve through-traffic movement. Detailed traffic studies/modelling in 2009 were undertaken. Council adopted in March 2010 the recommended option to realign and upgrade Park Street to provide a traffic route linking the Market Street and Monaro Street intersection with the Merimbula Drive, Reid Street and Sapphire Coast Drive intersection. The Market Street and Monaro Street intersection scope of this Tender, is the final stage of the Merimbula CBD Bypass Project. Works will commence on 19 June 2017, after the June Queen’s Birthday public holiday-weekend and Merimbula Jazz Festival, and will take an estimated 18 weeks (weather dependent) to complete. 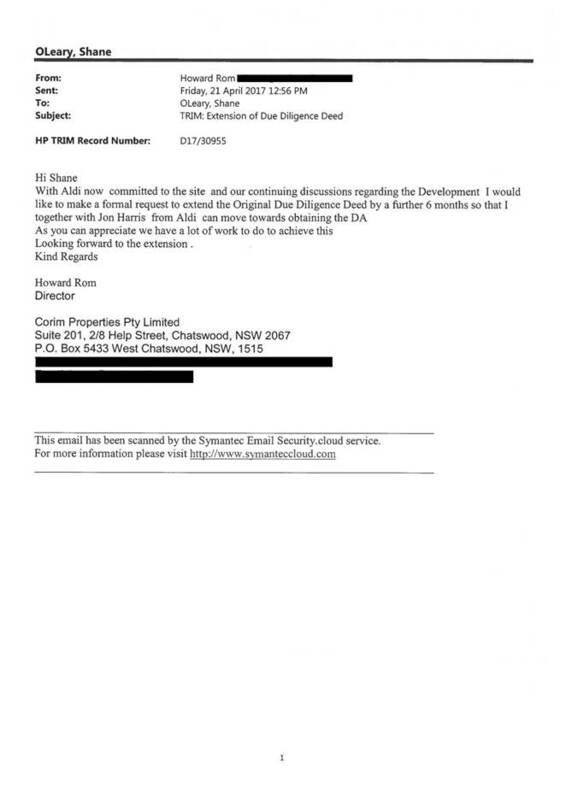 The tender was publically advertised on 28 March 2017 in the Sydney Morning Herald, local newspapers, the Council website and Tenderlink (e-tendering). The tender closed on 26 April 2017. Coverage of full scope of works. Qualifications, experience, quality. Local personnel, subcontractors, suppliers, other local benefits / outcomes. Sequencing / staging, traffic management plan, approach to issues / risks, demonstrated have thought through the “how” in detail. Detail, duration, credibility, consistency with methodology. Relevant info only. Padding and irrelevant information not considered. May influence above criteria scoring. The recommended Merimbula CBD Bypass option was adopted by Council in March 2010. The Merimbula CBD Bypass is reflected in the Bega Valley Shire Traffic Strategy, the Merimbula Development Control Plan (DCP) and the Merimbula CBD Landscape Masterplan. The works are part of the Merimbula CBD Bypass Headline Project. The assets are a main sealed road (Market Street) and local collector road (Monaro Street and Palmer Lane) under Council’s adopted roads hierarchy. The power assets belong to Essential Energy and the communications assets belong to Telstra. Relocation or upgrade works on these assets have been certified by the respective asset owners, and will be undertaken by accredited sub-contractors. A Review of Environmental Factors for the overall Bypass Project was undertaken by NGH Environmental, dated September 2015. The Contractor will be required to undertake the works in accordance with a project specific Environmental Management Plan. The reduction of congestion within the Merimbula CBD will increase the accessibility and appeal of the Merimbula CBD to locals, the wider community, visitors and tourists, which will have a positive impact on local businesses, and the wider economy of the Shire. · Media releases to local media. · Council’s website, social media and Merimbula Place Based Officer. The Project Engineer for the Merimbula CBD Bypass Project will manage the contractor undertaking these works. o effective communication initiatives prior to and during the works. · There are a significant number of underground services within the footprint of the works, some requiring upgrade or relocation. These services have been identified, located and detailed on the design drawings. The contractor is also required to engage a services locating specialist to physically locate all services prior to excavation works. · Environmental risks associated with the works include noise, dust, and sediment laden stormwater runoff into Merimbula Lake, potentially impacting on the oyster leases. The Contractor will be required to implement environmental controls and undertake the works in accordance with a project specific Environmental Management Plan. The Merimbula CBD Bypass Project will reduce traffic congestion within the Merimbula CBD and improve through-traffic movement. The Market Street and Monaro Street intersection, the scope of this Tender, is the final stage of the Merimbula CBD Bypass Project. 1. 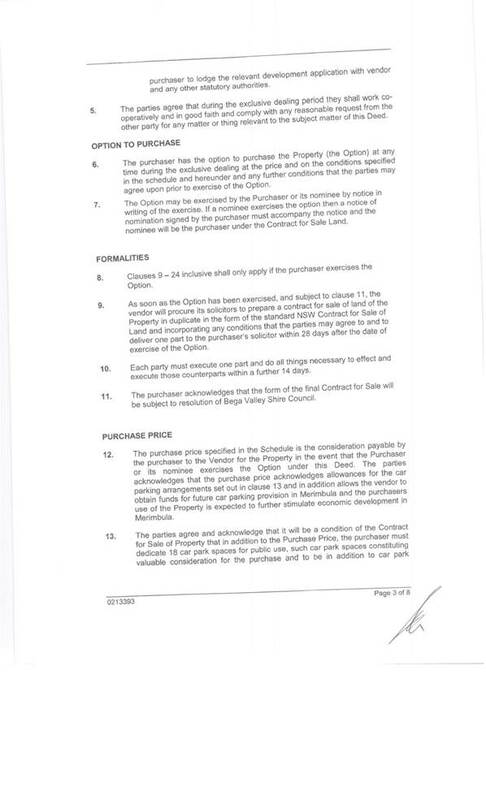 That Council accept the recommendation as outlined in the Confidential Attachment. 2. That Council accept the tender from <insert> in relation to the contract for the works described in Tender RFT 29/17 Merimbula CBD Bypass Market Street and Monaro Street intersection reconstruction, in the amount of $<insert> (including GST), subject to variations and provisional sums. 3. That authority is delegated to the General Manager, or the Director of Transport and Utilities in the absence of the General Manager, to enter into negotiation with the preferred tenderer to address identified issues, and subsequently to execute all necessary documentation. 4. That the other tenderer be advised of Council’s decision. This report recommends Council adopt the advice of the Bega Valley Local Traffic Committee from their meeting held on 3 May 2017. 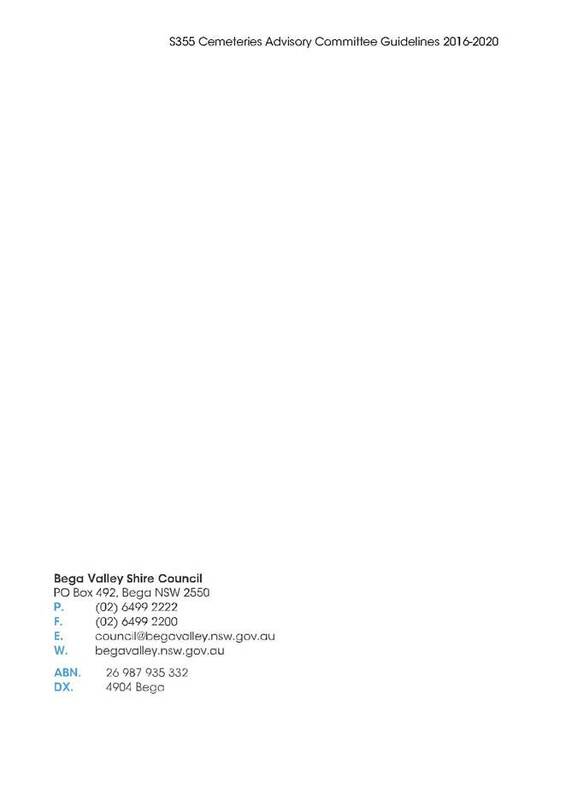 The Bega Valley Local Traffic Committee is not a committee of Council. The Local Traffic Committees operate under delegation from NSW Roads and Maritime Services who are responsible for traffic control on all New South Wales roads. The Bega Valley Local Traffic Committee held a meeting on 3 May 2017, the minutes of which have been distributed separately. It is a requirement for Council to formally adopt the recommendations from this Committee prior to action being taken. The recommendations were supported unanimously by the Committee. Council is required to exhibit its draft Integrated Planning and Reporting plans including the draft Community Strategic Plan, Resourcing Strategy, Delivery Program and Operational Plan and Budget, and Disability Inclusion Action Plan for a period of 28 days. All Councils in NSW are required to develop long term, medium term and short term plans under the Local Government Act 1993which has transitioned councils to the Integrated Planning and Reporting (IPR) Framework . In accordance with the IPR Framework, Council has prepared a range of integrated draft Plans to define and help achieve our community’s vision for the future. This includes the following draft documents: Community Strategic Plan 2040 (ten year plus outlook); Resourcing Strategy (including the Financial Policy, Financial Strategy and Long Term Financial Plan, the Asset Management Policy, Asset Management Strategy and Council Asset Plans, and four year Workforce Plan); Delivery Program (four year plan); and Operational Plan (one year plan). The draft Plans aim to set Council’s long-term strategic approach to delivery of its services and facilities and ensure these represent the needs of the community. The drafts documents have been developed over the past 12 months and are now proposed to be publicly exhibited with the feedback considered by Council before they are adopted. A copy of the will be placed on public exhibition following this meeting providing a further opportunity for comment and feedback. To inform the draft CSP 2040 and subsequent draft Resourcing Strategy, Delivery Program and Operational Plans, a Community Engagement Strategy based on social justice principles was adopted by Council. The engagement strategy ensured the draft CSP 2040 was developed in partnership between individuals, community groups, Council, other organisations and levels of government and addresses a broad range of issues relevant to the whole community. This extensive engagement phase took place over several months in 2016 and involved around 2,000 members of our community through the ‘Understanding Our Place’ project. We recorded what the community loves most about living in the Bega Shire, what they value, the challenges they face living here, what they want to change and their vision for the future. Information gathered through this project was published in the Understanding Our Place Report and was used to develop a series of community ambitions which were reported to Council, publicly exhibited in late 2016 and form the basis of the outcomes and goals of the draft CSP 2040. Following this exhibition, the draft CSP 2040 strategies and progress measures were developed. A Community Survey to measure the community's perception of the importance of Council services, Council’s performance in the delivery of key services and facilities, and customer service was undertaken in late 2016 and the results reported to Council. The results assist Council to identify priority action areas for the delivery of Council services and facilities in the Bega Valley Shire over the period of the Delivery Program. After the development of the draft CSP 2040, development of the draft Resourcing Strategy, Delivery Program and Operational Plan commenced. These draft Plans incorporated the community’s priorities and expected levels of service expressed during the first engagement process as well as information from a range of other community consultation activities. To test the priorities and direction of the draft CSP 2040 and draft Delivery Program were on track, a series of focus groups were held with interested members of the community and local government agencies and organisations. Following these focus groups, the draft documents were revised and further developed. This report proposes the final phase of engagement commences. This involves the formal public exhibition of all of the integrated Plans in accordance with the requirements of the Local Government Act 1993. Community feedback from the exhibition will then be considered by Council before the final documents are adopted. The draft Bega Valley Shire Community Strategic Plan 2040 (draft CSP 2040) is a long-term visionary Plan. It is the main strategic and aspirational document for our community and its purpose is to help individuals, community groups, Council, other levels of government and organisations build a stronger and better Bega Valley Shire. The draft CSP 2040 is an overarching strategy to guide Council decision making and all other strategies, plans and policies developed by Council seeking to support the implementation of the draft CSP 2040. This ensures that what Council does within its area of control is always focussed towards the aspirations the community has articulated. The draft CSP 2040 was developed following extensive community engagement through the Understanding Our Place project and incorporates the goals of NSW 2021, the draft South East and Tablelands Regional Plan and the strategies and actions from Council’s Fit for the Future Improvement Plan. Throughout the life of the CSP 2040, Council will be listening to our community to ensure it continues to reflect their long-term aspirations. The CSP will be formally reviewed again in four years' time. Council has developed a draft Delivery Program 2017-2021 and Operational Plan 2017-2018 which outlines what Council will do to help deliver the services required and manage the community’s assets and deliver where appropriate, actions to progress the community vision as articulated in the CSP 2040. The draft Resourcing Strategy outlines how the actions and activities of the draft Delivery Program and draft Operational Plan will be financed and staffed and the manner in which the community’s assets will be managed along with establishing the Council’s Long Term Financial Plan. The Long Term Financial Plan, Delivery Program and Operational Plan are reviewed annually to ensure they are applicable in the changing environment that Council operates in and to incorporate community feedback. The Resourcing Strategy is reviewed every four years. In addition to the draft CSP 2040, the draft Delivery Program, Operational Plan and Resourcing Strategy are also informed by a number of Council and NSW State Government strategies and plans with the 2016 Bega Valley Shire Council Community Survey which independently rates the importance and satisfaction of Council’s service delivery and performance. The draft Resourcing Strategy outlines how some of the community’s aspirations can be achieved in terms of time, money, assets and people. It links the draft CSP 2040 and the four year Delivery Program and annual Operational Plan by detailing the provision of resources to implement the strategies for which Council is responsible. It aims to ensure Council has the financial capacity and human, technical and plant/fleet resources to deliver services and look after the management of the community’s assets. The draft Resourcing Strategy is comprised of the Council’s draft Financial Policy, Strategy and Long-term Financial Plan; the draft Workforce Management Plan; the draft Asset Management Policy, Strategy and Asset Cass Plans; a draft Technology Strategy and a draft Plant and Fleet Action Plan. The draft Financial Policy, Strategy and Long-term Financial Plan provide a long-term financial blueprint for Council and the community that allows for the cost effective delivery of works and services and appropriate maintenance and renewal of our significant asset base. Council’s draft 10 Year Long Term Financial Plan has an emphasis on long-term financial sustainability. It also outlines how Council intends to ensure it maintains focus on the Fit for the Future ratios and the Council Improvement Proposal developed as part of being deemed Fit by the NSW Government in 2015. The Long Term Financial Plan is updated annually through the development of the Operational Plan and reviewed every four years in conjunction with the CSP. · “Balanced” – add to the Asset Management model a series of special rate variations for community priority new projects. Councillors determined the approach to be taken would be to move to the Asset Management model in year one (2017/18) by making reallocations of funding to the priority areas identified by the community through the Community Survey. During the period July to November 2017, Council will review in detail the Council’s Asset Registers and data in each Asset Management Plan looking to consider new models for service provision. Councillors have indicated they will engage with the community in relation to potential consideration of special rate variations in subsequent years only when this review has been undertaken. Councillors also noted a number of asset reviews such as the Aquatic Facilities Review and the Public Amenities Reviews will inform this process. No consideration of whether any application for a special rate variation will be undertaken until this work is concluded. Councillors have discussed options for how such increase could be applied. Councillors also indicated the potential opportunity presented through the current tourism review to investigate a new funding model for tourism promotions and marketing which may result in a review of the currently approved special rate variation for this purpose. Workforce Management Plans address Council’s human resourcing requirements for the four year period of the Delivery Program. The draft Workforce Management Plan aims to provide Council with the best people in the right positions to support its strategic direction and ensure there is capacity to develop innovative approaches to complex issues and deliver appropriate services effectively and efficiently. The draft Asset Management Policy, Strategy and Plan articulates how Council will plan to manage over $1.45 billion of community assets. The draft Asset Management Policy sets the broad framework for asset management throughout the Shire to support the CSP and Delivery Program. The draft Asset Management Strategy has been prepared following a review of the service delivery practices and asset management maturity. It outlines an asset management improvement plan detailing a program of tasks to be completed and resources required to bring Council to a minimum ‘core’ level of asset maturity and competence. The draft Asset Management Plan identifies asset service standards and outlines long term projections of asset maintenance, rehabilitation and replacement costs for all of the assets under Council’s control. The draft Asset Management Plan is an attachment to the Resourcing Strategy which is being exhibited as a separate document due to its size. Draft Asset Management Plans for each asset class are also on exhibition. Council has developed its first draft Technology Strategy to identify the priorities for the allocation of resources to deliver the greatest value to the organisation and the community. The draft Plant and Fleet Action Plan explains how Council will be developing a draft Plant and Fleet Management Plan to link to the Resourcing Strategy ensuring the effective delivery of its works and services and to achieve the objectives of Council’s adopted Delivery Program and Operational Plan. The draft Delivery Program and draft Operational Plan is presented in one document which also includes financial estimates for the four year period and a detailed budget for the operational activities to be undertaken as well as a statement of Revenue Policy for the applicable financial year. The draft Delivery Program outlines which aspects of the draft CSP 2040 are under the direct control and responsibility of Council. It identifies what actions Council is going to do in the medium term to work towards the goals and strategies in the draft CSP 2040 within the resources available in the Resourcing Strategy. The draft Delivery Program states what actions Council is proposing to do to work towards each of the draft CSP 2040 Outcomes over the next four years. The draft program also presents a description of what each of Council’s Service Areas does and indicates which Service Area is responsible for achieving the actions. The draft Delivery Program includes financial estimates for the four year period from 2017 – 2021. The current Councillors have also developed a Charter for working together and an Organisation Direction Statement for the four year period which has also been included in the draft Delivery Program. The draft Operational Plan provides more detail about exactly what activities Council will take in the next financial year to achieve the four-year Delivery Program. As outlined above a key activity in the year is the review of all assets and discussion on potential future funding models for discussion with the community. The routine ongoing activities and Operational Plan 2017 – 2018 activities of each of Council’s Service Areas are presented separately along with the Budget summary for both types of activities for the financial year. · proposed borrowings for the 2017-18 financial year. The Council determines fees and charges for a range of services such as: planning and building; library; children’s services and facility usage. These fees and charges form part of the Revenue Policy. The fees and charges proposed for these services and facilities for the 2017-18 year is detailed in the draft Fees and Charges document, and are aligned to Council’s pricing policy, some of which are set by statute. Council management committees have been provided the opportunity to submit their draft fees for 2017-18, and these have been included. The draft Plan also includes a 2017-18 Budget Summary which provides an overview of the total estimated income and expenditure for each of Council’s General, Waste, Water and Sewer funds as well as a breakdown of expenditure by Council services. The allowable Local Government Cost Index Increase on rates for 2017/18 is 1.5% which raises approximately $330k (last year it was 1.8%). The other main income source from the Federal Government, known as the Federal Assistant Grant which covers funding to the operations of the Council and to roads has not increased since 2014/15 when indexation was frozen. In 2016/17 all councils received a double allocation from the Roads to Recovery funding, $270K in Bega Valley Shire’s case, is not available for the 2017/18 year. Major cost increases have been insurances which have increased in excess of $250k, audit costs have increased by $15k, RFS have increased $188k and employee Award based increases are 2.5%. Council has applied a small increase to its fees as outlined in the Fees and Charges document. The full outline of the rates and charges is available in the Delivery Program. Neither of these requests have been included in the draft budget and require Council consideration. 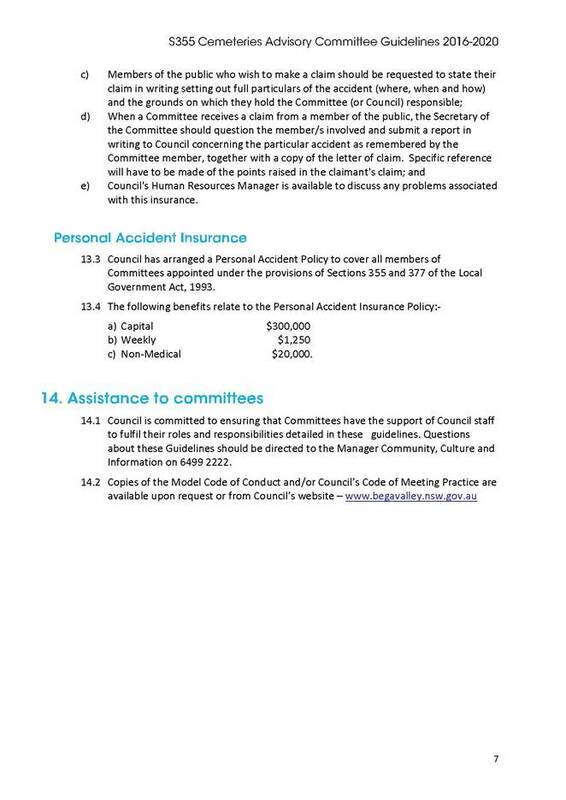 If Council resolve to include these items then a reduction in another General Fund items would need to be identified. That Council consider an allocation of funding in the draft 2017/18 budget development to include going to expressions of interest for detailed design building on the current CBD masterplan and to establish detailed working plans, including traffic and parking plans, in consultation with the respective communities for Merimbula and Bermagui CBDs. That strategic project planning of the detailed designs take into consideration, in consultation with key community stakeholders, budget development, including quantity surveying, so that Council can plan for full costs, and work can be staged when funding becomes available. Included in the program for the 2017/18 year is an allocation to undertake work on the development of a Commercial Centres Study which will form the first stage of this work and provide the framework for the development of detailed designs. This would then proceed in subsequent years when funding for works has been identified. 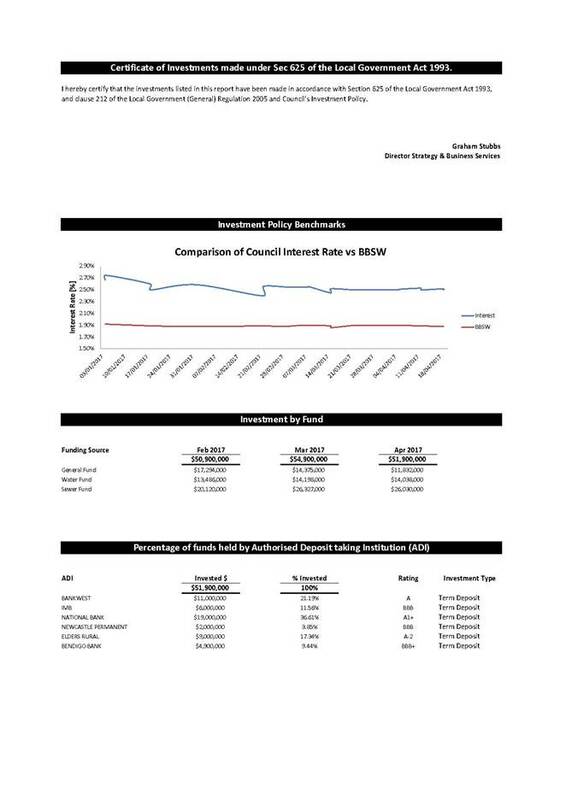 For General Rates, Council has applied only the allowable rate peg increase (LGCI) of 1.5%. This may manifest with a small variation in relation to various properties due to revaluations by the Valuer General carried out during the year. The table below (Table 1) sets out the proposed General Rates for 2017-2018. There is no proposed change to the current Stormwater Levy. Sections 496 and 504 the Local Government Act 1993 provide that the domestic waste management services of the Council must be financed by specific annual charges made and levied for that purpose alone. The Act prevents Council from applying ordinary rate income towards meeting the cost of domestic waste management services, nor can it use waste charge income for non-waste related functions. The term ‘domestic waste management service’ relates to the services that comprise the periodic collection of waste, generated on domestic premises, from individual parcels of rateable land and the services associated with recycling activities provided to these properties. · Recycling and waste minimisation activities associated with domestic waste collection and disposal. The access charge is calculated using a volume formula that is dependent upon the square of the size of the meter connection. The access charge is shown on the annual rate notice and it is independent of the level of water consumption during the year. The base access charge is related to the cost of providing access to a 20 millimetre water connection. Access charges for larger water connections are based on increments of the base charge according to the volumetric factor shown in the table below. The access charge is designed to cover some of the costs incurred by Council in providing infrastructure such as reservoirs, pump stations and reticulation systems. Because of the fixed nature of the costs incurred by Council in operating the infrastructure, the access charge applies to all properties able to connect to the system regardless of whether or not a connection is in place. All properties falling within the defined water supply boundaries are subject to compulsory water access charges. For land that is exempt from water access charges, see the section under general rates. The water usage charge for 2017-2018 is set at $2.86 per kilolitre. The water consumption charges are designed to meet the fixed and variable operating costs related to the provision of water supply. The water charges for the 2017-2018 financial year are set out in the following table. · A flat charge of $591.50 for all properties that are able to connect to the Council’s sewage service network and remain unconnected. Non-residential sewer charges are calculated using a formula prescribed by the NSW Department of Water Best Practises guidelines. - Applies the Asset Management model as considered in the Financial Strategy for year one of the LTFP and directs funding towards key infrastructure categories within the budget capacity to do so without loss of services. Under the Local Government Amendment Act, Council is required to develop plans as outlined above and to publicly exhibit documents in the IPR framework for a period of 28 days. The Disability Inclusion Act 2014 (DIA) demonstrates the ongoing commitment of the NSW Government to building an inclusive community and requires the government to produce a Disability Inclusion Plan. The NSW Disability Inclusion Plan supports the DIA and provides a strategy to implement the Act’s objects and principles across government and the community. Disability Inclusion Action Plans (Action Plans) also mandated by the DIA, play a critical role in promoting the ethos of inclusion and provide the practical measures by which intent is transformed into action by agencies and local government. This definition reinforces the importance of viewing disability as the result of interaction between people living with a range of impairments and their physical and social environment. Disability is not just about the impairment. The onus to break down barriers rests with the whole community. Disability action planning is not a new approach. Since the introduction of the NSW Disability Services Act 1993 (DSA), all NSW government departments and some other government bodies have been required to undertake disability action planning. The DIA replaces the DSA, and strengthens the commitment to inclusion, consultation with people with disability and protection of their rights. 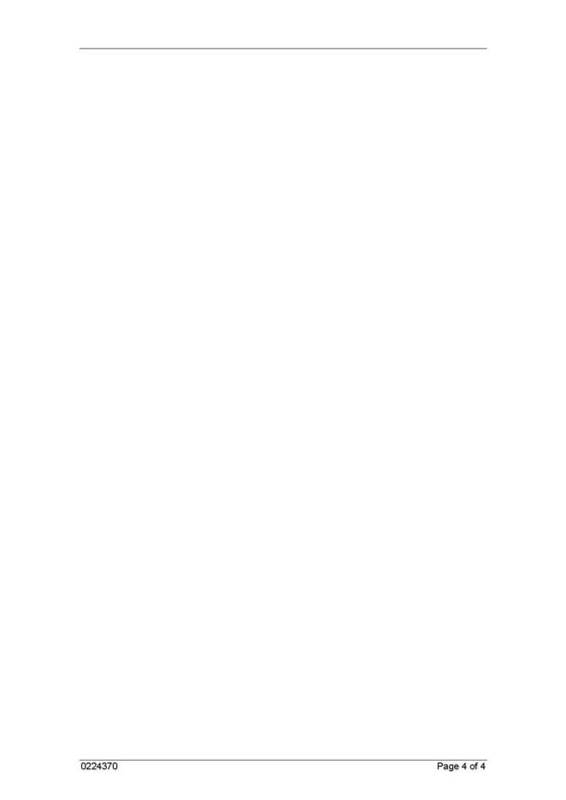 These guidelines apply to all NSW government departments, some other government agencies and statutory bodies which are included in the Disability Inclusion Regulation 2014 and local councils. The term ‘public authority’ is used throughout these guidelines to describe these entities. Of course all other bodies or organisations that are not required to make Action Plans by law, but which choose to do so, can follow these guidelines too. Under the Disability Inclusion Regulation 2014, public authorities that are required to have Action Plans are required to have them in place by 1 December 2015. Local councils are to have Action Plans in place by 1 July 2017. The Community Strategic Plan 2040 and the linked documents set the strategic framework for the term of the current Council. As outlined previously, there has been extensive community engagement in the development of this suite of documents through the Understanding Our Place project, the community survey, and Focus Groups. The Council is now required to publicly exhibit its draft IPR documents. Public exhibition will include documents being available in all library branches, on Council’s website and advertisements in local paper and electronic media. This year Council is proposing the adoption of an entirely new suite of IPR documentation. The draft Community Strategic Plan 2040 has been developed following an extensive and successful community engagement process which has informed the development of all of the other IPR documents. Council is also placing on exhibition its first Disability Inclusion Action Plan, a key document and step forward in making the Shire a more inclusive place. Council will consider all submissions made during the exhibition prior to adoption of the Plans, Policies and Strategies in June 2017 prior to adoption at the Council meeting on 28 June 2017. Following the adoption of the documents, Council will begin implementing the Plans and Strategies and report regularly on the progress made. 6. That all submissions received during the exhibition period be considered by Council prior to adoption of the documents. Council has previously supported the Life Education van to assist with its movements around the Shire. This was done through the Works budget. Life Education New South Wales (LENSW) is a registered charity that provides a van that travels to local schools, educating young people on how the human body works. Council has previously offered partial support to the program, from 2004, following a report to Council. Council Works staff moved the van into the region and then volunteer drivers moved the van to its various visits (18 around the Shire). Over the last two years the impact on the Works budget was fully realised and the organisation was advised that staff were not available to assist in this current financial year. The organisation was referred to various funding opportunities however have not applied. This month they have again contacted Council requesting support due to the loss of volunteer drivers. Life education have requested that Council move the van to each primary school in the Shire – 7 additional moves at an approximate cost of $4,000 in staff time/equipment – we have not budgeted for this and have had to refuse their request. The first programmed move is on 16 May 2017. The program has requested financial support from Council and have indicated they will apply for funds to assist. Due to the nature of the funding request which is outside the delegations to the General Manager and due to the urgent nature of the request staff have assisted with the first move. This program has not been supported in the current operational plan. The program has merit and is utilised by local schools, however the number of participating schools has reduced since the program started in 2004. The organisation has not followed up funding requests and has assumed that local arrangements were in place. There is no identified budget for this. Support to the Works area to undertake the moves could be provided through the Community Support Grants area in the General Manager’s budget area. There is sufficient funds to support the Works section to undertake the moves. The program may not run locally and this may be, incorrectly, seen as Council not providing support. Clearly the program was advised over 12 months ago that this was not a supported program in the adopted budget. 1. Council could resolve not to support the movement of the van in the Shire. 2. Council could resolve to support the moves for this final year, funded as outlined, and again advise the program that they seek funding from alternate sources, noting that Council support will not be available in future years..
3. Council could continue to move the van into the future. Due to the last minute nature of the request staff support option 2. 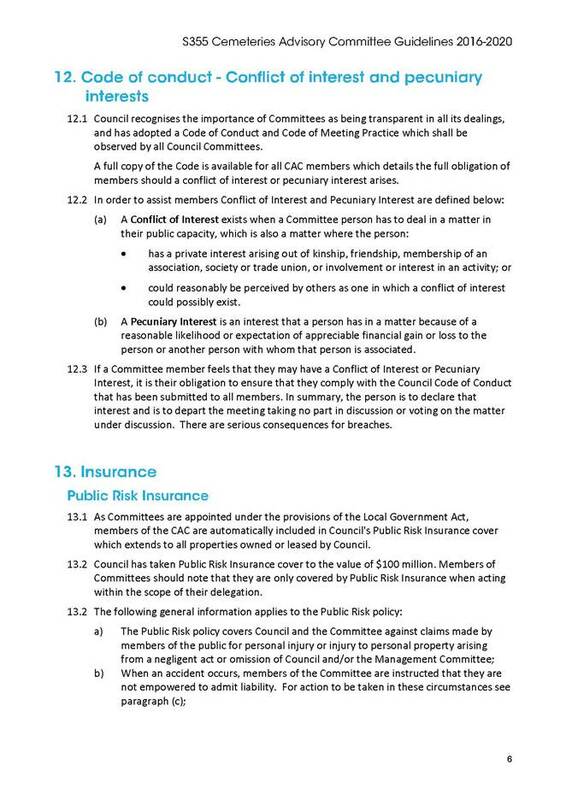 In accordance with Council’s Code of Meeting Practice (2011), this section of the agenda will be chaired by Cr Bain. 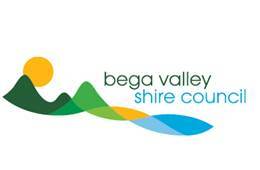 Bega Valley Shire Council was successful in obtaining a Special Rate Variation (SRV) in June 2013 for the purpose of funding the renewal and upgrade of its public domain building assets. This report nominates various projects and seeks formal Council approval to fund those projects from the SRV. The Independent Pricing and Regulatory Tribunal (IPART) approved Council’s application under Section 508A(1) of the Local Government Act 1993 for a Special Rate Variation (SRV) on 12 June 2013 for the purpose of funding its program of asset renewals and upgrades, including public halls and public domain buildings. Dedication of SRV funds toward building upgrade and renewal projects enables Council to increase spending on routine building maintenance which in turn prevents early deterioration of assets. Council reports each rating year through its Annual Report on the program of expenditure that was funded by the SRV and the outcomes achieved as a result of the special variation. Council has engaged the services of an external consultant to prepare a Condition Assessment Report on all Council owned and managed building assets. Once the final report is received by the consultant, a list of projects for the 2017/18 financial year will be compiled based on priorities identified in the consultant's findings. There are however several smaller projects which have immediate work health and safety considerations which are being recommended for completion using the remaining balance of the SRV funds for the 2016/17 financial year. Following an Organisational Review in 2014, the function and operation of Council’s building assets was delegated to the functional asset owner of each facility. The functional asset owners have direct control and responsibility for the day to day operations and maintenance of their assets, however to assist with renewal and upgrade programs and centralised procurement of routine maintenance and services, a Functional Asset Owners Group was established. The main focus of the Group is to oversee the operational governance of the building asset portfolio and collectively determine suitable projects to be funded from the SRV. The Functional Asset Owners Group meets on a monthly basis and operates within a Charter. The commercial kitchen at the Council owned and operated Childcare Centre in Eden requires a modern equivalent renewal due to various compliance issues identified in a recent food premises assessment report. The issues identified solely relate to non-compliance with current standards for a commercial kitchen of this nature. The existing kitchen is from the building's original construction and is over 20 years old. It requires significant modification and a complete renewal would be the most cost effective. As with the Eden Childcare Centre above, the Bandara Centre is also a Council owned and operated childcare centre located in Bega. The kitchen is of a similar era and size to that of the Eden Childcare Centre and requires significant investment for modern equivalent renewal due to non-compliance with current standards. Recent electrical works carried out at the museum have identified the electrical installation at the museum requires a complete rewiring to bring it up to current standards. The existing installation is extremely old and poses a risk to the heritage listed asset as well as a safety aspect for customers and volunteers working at the museum. The Murrah Hall has an outdated septic system and expired absorption trench to allow for the high volume events that occur on a regular basis at the Hall. The existing tank is in reasonable condition and has recently been pumped out. Using this as part of the new retro fitted waste water treatment system and Fuji clean system will ensure a safe and effective system into the future that does not pose any environmental concerns. Work will also include excavation, plumbing and associated electrical works. The main external staircase leading into the Bermagui Community Centre is in need of repair and upgrade. The span of the timber stairs has proven to be too long and a sag in some treads has created an inconsistent rise in the steps causing a major trip hazard. The stairs need a new metal mid span support to the treads which is to be bolted to the frame and concrete slab. Some other treads need replacing. In addition to this, the timber staircase located to the rear of the building requires a complete renewal as all treads and side supports have suffered timber rot and are failing. Following construction of the Bega Valley Commemorative Civic Centre, the lower section of the wall between the Civic Centre and the Administration Building was not completed and is exposed to the elements. It also does not meet the Building Code of Australia’s fire rating. As Council did not have funds available for the renewal and upgrade of building assets, this project has remained unfinished and poses a risk to building security and staff safety. · Review management of capital renewal and replacement activities to ensure Council is obtaining best value for resources used. The ranking criteria used to determine priority of identified renewal and replacement proposals weighs risk/safety highly. If the two Childcare Centre kitchens renewal work cannot be funded from the SRV, alternate arrangements for the preparation of food for the children who use the centre each day will need to be made. This may require outsourcing this function or having the meals prepared off site in a commercial kitchen elsewhere. Each of the other projects recommended have either safety or environmental risks associated with them and should be attended to without delay. Council does not currently have funds available for the renewal or upgrade of its building assets. If the projects recommended cannot be funded from the SRV the works will not be able to proceed. If Council approves the renewal and upgrade projects recommended in this report, a balance of $196,343 will be available for further SRV projects. The results of the recent condition assessment carried out by MBM Consultants of all Council’s building assets will assist the Functional Asset Owners Group to determine priority projects for the 2016/17 SRV balance as well as the SRV for 2017/18. A report will be presented to Council within the first quarter of the 2017/18 financial year recommending suitable upgrade and renewal projects for its public domain buildings. In accordance with the recommendations made by the Office of Local Government (OLG) Investment Policy Guidelines published in May 2010, the Strategy and Business Services Group has made the monthly Investments Report an attachment to the Business Paper. This allows a stand-alone report to be published on Council’s website for the public to view without having to peruse the Council’s Agenda for the relevant meeting. Council has an Investment Policy published under Policy number 5.07. This Policy is reviewed every 4 years by Council and annually by Council officers. 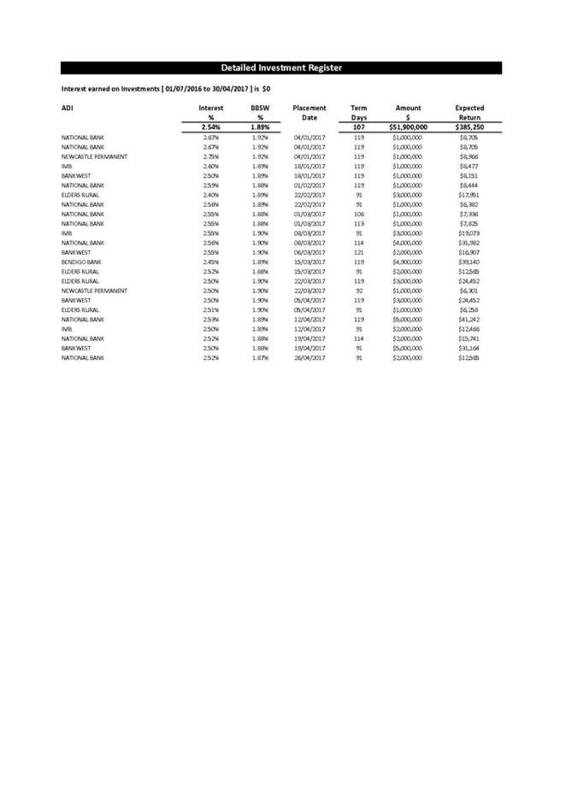 In addition, there is $ 1,586,600 in uninvested funds in Council’s operating account. There is an additional $4,000,000 at call investment held in Council’s Transactional Account. · Each fund’s allocation can only be utilised on its specific operations. For example, Water Fund cannot use its financial resources on General Fund projects, etc. · Externally Restricted is defined by purposes that are “restricted” by external legislation or regulations, such as unspent grants or loans tied to a specific project, or development contributions held for expenditure in accord with an adopted s94/s64 contributions plan. · Internally Restricted is defined by “restrictions” placed upon the use of these funds by Council internally, such as asset replacement, weeds, property, employee entitlements and the like. · Unrestricted funds are available for day to day operational uses, or emergencies. Those funds are reviewed daily for short term investment, depending on revenue cycles such as rates instalments. The restrictions reported in Table 2 relate to 30 April 2017. At the Ordinary Council Meeting held on 22 February 2017, Cr Bain asked the Director Planning and Environment if he was aware the vegetation at the Rotary Park in Eden (largely tea tree) had grown to the extent that a once lovely lookout area for viewing across the bay is now simply a park, not a lookout. Could Council please do something about this? The Director Planning and Environment took the question on notice for liaison with the Director Community, Relations and Leisure. Council officers and a qualified arborist undertook a site visit on 11 April 2017 to assess the situation. It was agreed that works should be undertaken to re-establish views, minimise any risks to public safety and to reduce the quantity of pest plants. A contractor was engaged to undertake the works in the last week of April 2017. A media release was issued advising the public of the works. This report responds to the Question on Notice raised by Cr Tapscott at the Council Meeting on 5 April 2017. I met with our local member The Hon. Andrew Constance MP and provided him with a copy of our Understanding our Place report which provided detail into the development of the Bega Valley Shire's Community Strategic Plan noting there was a large emphasis on making sure our residents have adequate medical services in the Shire. The Hon. Andrew Constance MP understands the community's desire to make sure the hospital is delivering and will confirm when the independent review is finalised. This report responds to the Question on Notice raised by Cr Griff at the Council Meeting on 4 April 2017. There is no avenue for Council to contribute to the hospital review as it is a confidential independent review being undertaken at the request of the NSW State Government. Having spoken with our local member The Hon. Andrew Constance MP about issues raised by community members through the Council, I can advise he is aware of the issues and concerns.